When I think of leafy patterns, my mind goes to Tolkien’s Ents and Entwives. No matter how many times I read those books, I still find it easy to get caught up in that world. Fimbrethil was an Entwife – one of the loveliest. This is a quick knit with lots of lace to keep your interest but easy enough to follow. 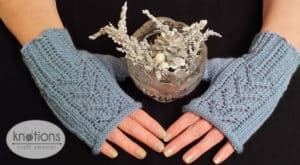 Both the top of the mitt and the top of the thumb are simply a few rounds of purl stitches, but I think they marry nicely with the lace to give the design a clean look. 24 sts and 36 rows = 4” [10 cm] in St st after wet blocking. Rnd 1: *P1, k2tog, yo, k1, yo, ssk, p1, rep from * to end of round. Rnd 2: *P1, k5, p1, rep from * to end of rnd. To be worked over first 21 stitches only on each round throughout, except where otherwise indicated. Rnd 1: P2, k1, k2tog, yo, k1, [yo, ssk, k2tog, yo, k1] twice, yo, ssk, k1, p2. Rnd 2 and all even rounds: P2, k17, p2. Rnd 5: P2, k1, k2tog, yo, k2, yo, ssk, k3, k2tog, yo, k2, yo, ssk, k1, p2. Rnd 7: P2, k1, k2tog, yo, k3, yo, ssk, k1, k2tog, yo, k3, yo, ssk, k1, P2. Rnd 9: P2, k1, k2tog, yo, k4, yo, sk2p, yo, k4, yo, ssk, k1, p2. Rnd 10: Rep rnd 2. Sk2p – Slip one, k2tog, psso. The Lace Rib is worked over the entire cuff, but the Leaf Lace is only worked once on each pattern round. I used one ball of yarn but used nearly all of it. So, if your gauge is off, or if you add length anywhere, you may need a bit more yardage. CO 42 sts. Distribute evenly over 3 DPNs and join to work in the round. 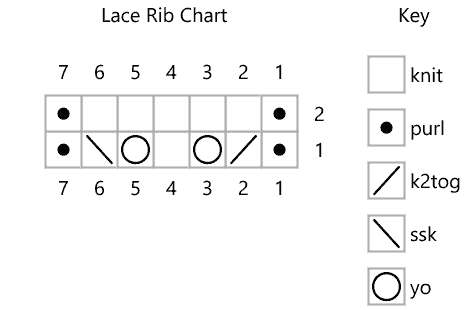 Work in Lace Rib (either from the chart or written instructions) for 24 rounds or about 2.5” or 6.35 cm. I suggest rearranging your stitches here so that you have 21 stitches on needle one (being careful to keep the beginning of your round the same). This way, you will know immediately if your stitch count is off. 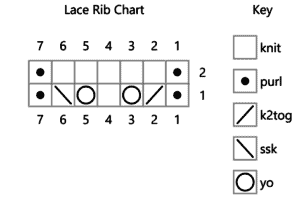 Rnd 1: Work Leaf Lace Stitch pattern (either from the main chart or written instructions) over the first 21 sts, knit to end of round. Rnd 2: Work Leaf Lace Stitch over first 21 sts as set, k1, pm, k1, pm, knit to end of rnd. Rnd 3: Work Leaf Lace as set, k1, sm, m1R, k1, m1L, sm, knit to end of rnd. Rnd 4: Work Leaf Lace as set, knit to end of rnd. Rnd 5: Work Leaf Lace as set, k1, sm, m1R, knit to second marker, m1L, sm, knit to end of rnd. Work Leaf Lace over 21 sts as set, k1, remove marker, k1, slip 16 sts onto waste yarn, remove marker, knit to end of rnd. Continue working Leaf Lace as set, and knitting all other sts until you have completed chart or Leaf Lace Stitch 4 times total. Purl 4 rnds, BO purlwise. Slip thumb stitches onto three DPNs and remove waste yarn. Pick up one stitch at gap, knit to end of round ,pick up another stitch over gap. Knit 3 more rnds. Purl 4 rnds. BO Purlwise. CO 42 and work Lace Rib as for right hand. Rnd 1: Work Leaf Lace over first 21 sts as for right hand, knit to end of round. Rnd 2: Work Leaf Lace as set, knit to last 2 sts of round, pm, k1, pm, k1. Rnd 3: Work main pattern as set, knit to first marker, sm, m1R, k1, m1L, sm, k1. Rnd 4: Work Leaf Lace as set, knit around. Rnd 5: Work Leaf Lace, knit to first marker, m1R, knit to second marker, m1L, sm, k1. Rep rnds 4 and 5 until you have 17 sts between markers. Work Leaf Lace as set, knit to first marker, remove marker, slip 16 sts onto waste yarn, k1, remove marker, k1. 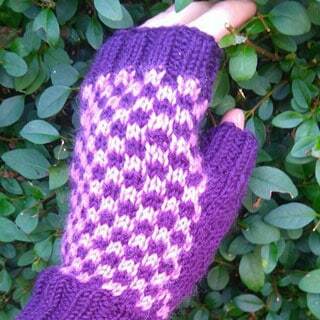 Work main pattern, top of mitt and thumb instructions as for right hand. Weave in all ends. Block and enjoy! Deborah has been knitting since 2004. She has been teaching knitting for six years and loves to share the craft with others. As soon as she picked it up, she thought, “I should’ve been doing this my whole life!” and has been trying to make up for lost time ever since. She is new to designing, but loves detailed work and adores yarn, so she is sure the design business was destined to happen. She has a grown daughter who has, in recent months, become a slightly reluctant knitwear model and a husband of eighteen years who has become a somewhat hesitant knitwear photographer. She likes old television shows that remind her of her childhood in the ’70s. Remember “Land of the Lost”? It had claymation dinosaurs. She has watched that more recently than she cares to admit. She is turning 50 this year, but she hopes you will be classy and keep that between the two of you.